Leeds United chairman Massimo Cellino has emphasised his support for manager Uwe Rosler. Rosler became the side's fifth manager in 12 months, replacing Neil Redfearn in May. The 46-year-old has had a mixed start at Elland Road, with the Whites having won two and drawn five of their nine games. "He's doing a beautiful job. 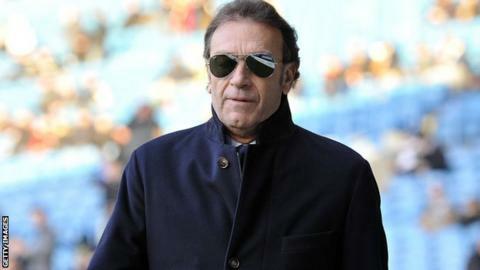 It's a team that when it's ready, it's going to fly," Cellino told BBC Radio Leeds. "We are starting to build a team and a new mentality. We know that when you want to build something, you need to do the foundations and that takes more time. "If we are rash with the foundations, we risk breaking the building like we have done before. If we don't do the same with the team and the players, we risk wasting time like in the past years." Leeds have had plenty of off-field struggles in the last 12 months, with executive director Adam Pearson recently quitting the role after four months at the club. Since joining Leeds in April 2014, Cellino has overseen the tenure of five managers. Brian McDermott and Darko Milanic lasted one month each under Cellino, while Neil Redfearn was the longest serving with six months at Elland Road. Cellino, who returned to the board in May after being banned by the Football League because of tax evasion, said he was confident Rosler could build a side for the future. "When you lose a game, you think it's the coach's fault because it's an emotional game," he added. "That's during the game because we are all fans. After 90 minutes you have to go down and become a chairman again. "It's a team that when it's ready, it's going to fly. We have a young team and we have to sacrifice ourselves a little bit to have a better future. "I don't talk about promotion but we are building as a club. I have to think in that way for the good of the club."